Embellishment and details are the items you’ll find in a traditional-style kitchen. The more embellishments, the merrier. The traditional kitchen embraces details and personalization, unlike a modern-style kitchen which strives for minimalism. In other words, it is a reflection of you. The traditional kitchen is warm and inviting and will evoke memories with its down-home feel. An outside kitchen area might be more appealing for entertainment, or for the family to gather for the evening meal. But in reality, there is nothing like a traditional kitchen found at the hub of the home where the family reconnects after a long day at work or school. So, a beautiful home, in an exquisite city is so deserving of a well-designed traditional kitchen. Nothingcreates a warm and inviting atmosphere like natural hardwood. The perfect traditional kitchen is one whose natural flooring is in alight finish and melds seamlessly into the adjoining rooms. You might even want to try planks made of repurposed wood for your floors – it will give your kitchen a rustic look and feel like no other. Match that light-colored flooring with a similarly colored cabinet finish and you’ll have a cozy, warm look for starters. If you have the room and the budget, try incorporating an island into your kitchen, likewise in a light wood finish. All three … floor, cabinets and island will harmonize and complement one another and add to the overall ambiance of the kitchen. Space is always needed in the kitchen and an island will free up additional countertop room for all those seldom-used, but ever-present, small appliances lined up and languishing on precious counter space. Adding shelving units in colors that complement the other wood finishes will complete the look. Voila! A revitalized appearance and lots more storage to keep that kitchen tidy and to enable you to find everything at a glance in your traditional-style kitchen. While dark-toned woods are obviously also an option for creating the traditional kitchen, light-toned woods are preferable because they keep the kitchen area looking light and airy. Even with a huge kitchen window and light streaming in, dark woods tend to create a harsher look. Dark-colored woods in the kitchen are often associated with a more old-world style, such as one would find in Tuscany-look furnishings or cabinetry. Of course any significant renovation in the kitchen might go beyond what is termed the typical DIY project. 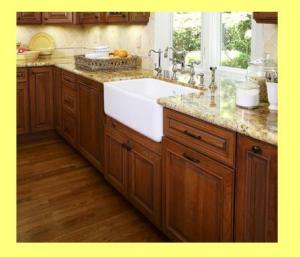 Why not consider retaining the services of a kitchen renovation specialist in Los Gatos. If you are looking to make another significant change to your kitchen in an effort to strive for a more traditional-looking kitchen, the biggest change would be the enhancement to cabinets and cupboards since they do encompass much of the kitchen area. While installing new cupboards and cabinets can be costly, simply re-facing them with a genuine-looking wood finish would be relatively inexpensive, rather than the more formidable cost of replacing these storage units with genuine hardwood. Another fun, and somewhat frivolous, and especially inexpensive option is painting the cabinets and cupboards in a warm hue that complements the kitchen walls, furnishings and any light fixtures. The cabinet hinges and pulls and knobs are important little gizmos in the traditional kitchen and you make them stand out style-wise in warm, burnished tones which add a touch of hominess to the room. The more hardware, as stated before as to abundance of embellishments, will only to serve to define the traditional kitchen better. Lighting is pretty special in a traditional-style kitchen as well. Nothing shows off the warm wood tones in cabinetry, cupboards and floors like the glow from a large chandelier or an ornate trio of pendent lights. As to sconces –if you’ve got the room on the kitchen wall, just add a few more embellishments. For a country-looking as well as elegant theme, try coach-style lanterns … and – no, they are not just for outside anymore. They will add a warm glow to the kitchen area. The use of splash backs in your kitchen creates color and vibrant touches and those enhancements can be simple or ornate, hand-made designs. The splash backs serve a purpose – not only do they keep the wall pristine, but, depending on the tile design chosen, they can lend an entirely new look to your traditional kitchen. Go for cozy in colonial blue or get a large infusion of color with vibrant, designer-inspired tiles. Use as little or as many as you wish. It is a way to personalize your kitchen and add interest. With a little imagination and personalization your traditional kitchen becomes an extension of you, so really make it special by consulting with a kitchen renovation specialist today. There are more opportunities to create a more-perfect traditional kitchen.